There are many beneficial features in the Focus RS that deserve a closer look. 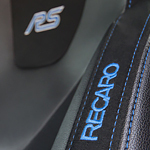 The Focus RS has a performance all-wheel-drive system that adapts automatically to driving conditions. It also lets you manually select between Normal, Sport, Track, and Drift modes depending on how you want the vehicle to respond and where you are driving. There is also a SYNC 3 system installed that provides an enhanced level of voice control over your phone, music, navigation and comfort. There are many other features of the 2018 Ford Focus RS. To learn more about them and to take one out for a test drive, please visit us at Victory Ford.